Moving food grade items from one destination to another isn’t simply a case of throwing items into the back of a truck or into a rail car and forging ahead. That’s because different products have to be assessed according to their long-term viability. Transporting bulk liquid food offers a much different set of concerns as opposed to items that may have a much different shelf life. Those responsible for either driving or shipping food grade products need to have the pertinent rules and regulations ingrained in their mind. That approach helps make simple things like hygiene and washing procedures of the trucks second nature and allows for greater peace of mind. For example, some companies neglect to keep track of the most recent deliveries within a transport vehicle. 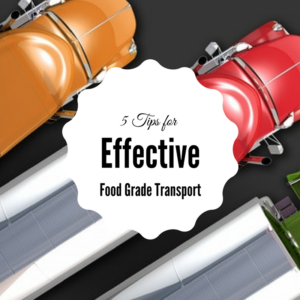 That can lead to hazards when it comes to food grade transport, especially if the previous product was a non-food item. Also, some companies claim to know all the nuances involved with Kosher food deliveries, which isn’t always the case. Food grade items can obviously be transported with any other item, yet doing so can very well compromise the quality of the items inside. That can mean that odors from the items that should not be inside or the presence of raw foods in that vicinity can bring with them potential dangers. The easiest way to avoid this type of situation is to make sure that any shipment of food grade products contains only those items. Much like the educational aspects that training is expected to cover, a clear understanding between the food processor and the transport company should be in place. All of the safeguards in world won’t do much good to protect food grade items if the mode of transportation charged with delivering them hasn’t been properly maintained. Breakdowns on the road or undetected damage inside a trailer can devastate the product, which usually ends up relegating it to the trash bin. Making sure that such regular maintenance is performed should be a basic understanding, with the transport company having properly maintained records to show such adherence. Companies that seek to save money putting off maintenance will most likely look to cut corners in other areas. During the course of any transport, regular checks on the proper temperature for certain items will help avoid disaster upon arrival at the intended destination. That’s because any breakdown or other problem that may develop can be detected quickly, with plans to address it already in place as part of a contingency plan. This is something that’s best accomplished through the use of up-to-date technology that allows for the driver to immediately tackle any problem. It also allows for a shipping company to maintain a consistent pulse on the product in question. The process of transporting bulk liquid food or any other product shouldn’t have to require a leap of faith when it comes to working with a carrier. Companies that offer reduced prices but lack any true legacy of consistent deliveries should make any business wary. Other factors that should raise red flags for those companies whose business depends on seamless bulk food grade transportation. A free flow of communication should be evident from the outset, with any questions being promptly answered. Any deviation from that approach should make it an easy decision to look elsewhere. Kan-Haul knows the ins and outs of food grade transportation, having developed their special level of expertise over the course of over three decades. So whether you’re transporting bulk liquid food, refrigerated items or need a specialized delivery, it makes a good deal of sense to contact us to handle the job.